Call of Duty: Black Ops III – Eclipse DLC. The Call of Duty: Black Ops 3 Eclipse DLC is finally available for the Xbox One, one month after it was released for the PlayStation 4 console. The new DLC comes with new multiplayer maps and Zombies content. In the latest episode of the Zombies experience, the Origins character heads to “Zetsubou No Shima”. This is a tropical island where experiments with Element 115 have created some nasty, pretty terrifying creatures. – Knockout, a Shao Lin Temple on a Private Island. 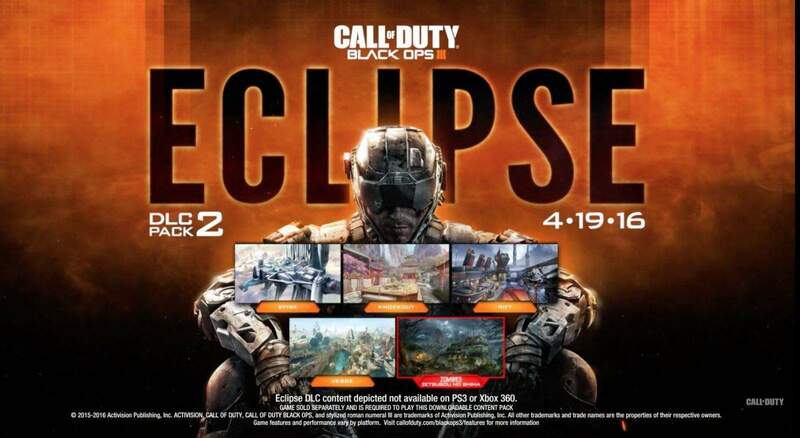 The same DLC has already been released for PC before, so if you’re a PC gamer it’s good to know that the Eclipse DLC is already available for the PC version of Black Ops III. To make things even better, the new DLC patch was released exactly when the double XP weekend event is underway. This time, double XP has been added for weapons, which means that you will be able to level up your weapons easier while playing on the four new multiplayer maps. The double XP event will end May 23, 2016 at 6PM BST.